Sneak Peek | Alessandra’s New Nursery! Happy Friday my loves!! Today is an exciting day because we’re starting to do installs for Alessandra’s new nursery in our house! 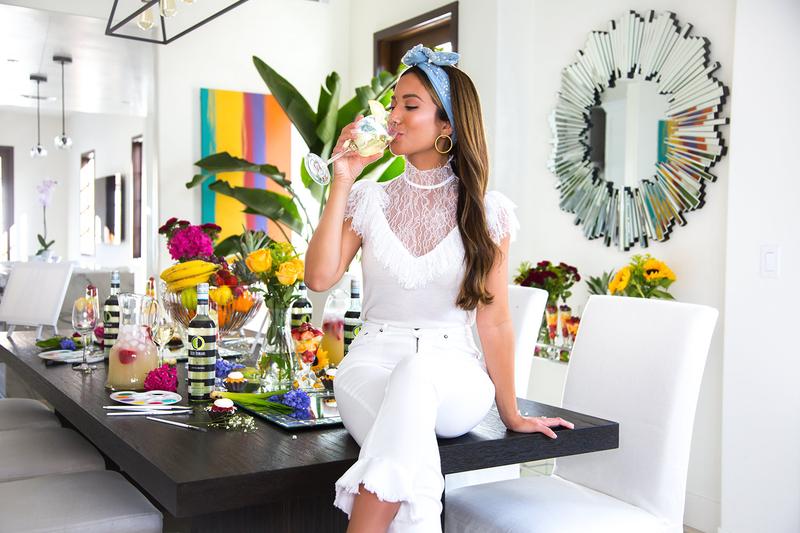 For the past few months, we’ve been working with an incredibly talented interior designer, Naomi of Little Crown Interiors to transform this space into Alessandra’s little oasis. It’s been such a fun and exhilarating project and I can’t wait to reveal this space with you in just a few short weeks! As many of you know in my last apartment, we turned my custom closet room into Alessandra’s nursery for a few months before we moved into this new house. Since we already knew we were moving into a new home, we didn’t spend that much time on creating a real nursery space. Back then I started thinking about ideas for her nursery and was really excited to wait until she had her very own room that we could make into something really special. I really wanted her nursery to be somewhat a reflection of my own personal aesthetic. For the color scheme, I wanted to keep a neutral color palette mixing in some fun elements like wallpaper, pops of color and gold accents. Our main color palette is white, ivory, blush, mauve, and hints of sage green which ties in perfectly with the gorgeous blush floral wallpaper that I can’t wait to show you once it’s installed! The rest of my house is very neutral with silver accents, so I really wanted this space to be exciting, fun and playful just like Ale! What I love most is how Naomi kept the main pieces neutral and built up the color though little accent pieces that are sage green, blush and mauve. 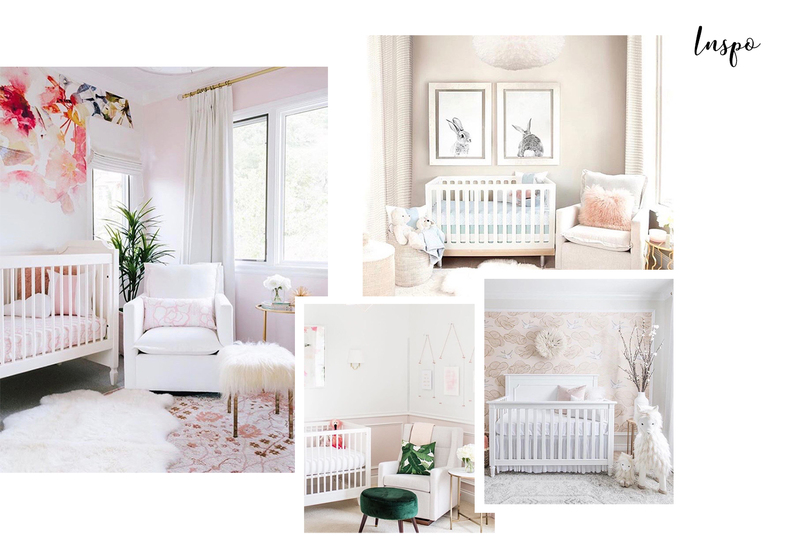 The overall feel of the nursery is chic and fun, yet cozy and rustic at the same time. When we first started working on this project with Naomi, I had so many ideas and references of what I wanted this space to look like but it’s always so hard putting your ideas into action. I was scouring Pinterest looking for inspiration for everything from decor, cribs, wallpaper and rugs. Naomi knew exactly what I wanted and made sure every detail was executed the right way. The one thing I couldn’t stop thinking about from the beginning was an acrylic crib..there’s just something that’s so dreamy and seamless about an acrylic crib. 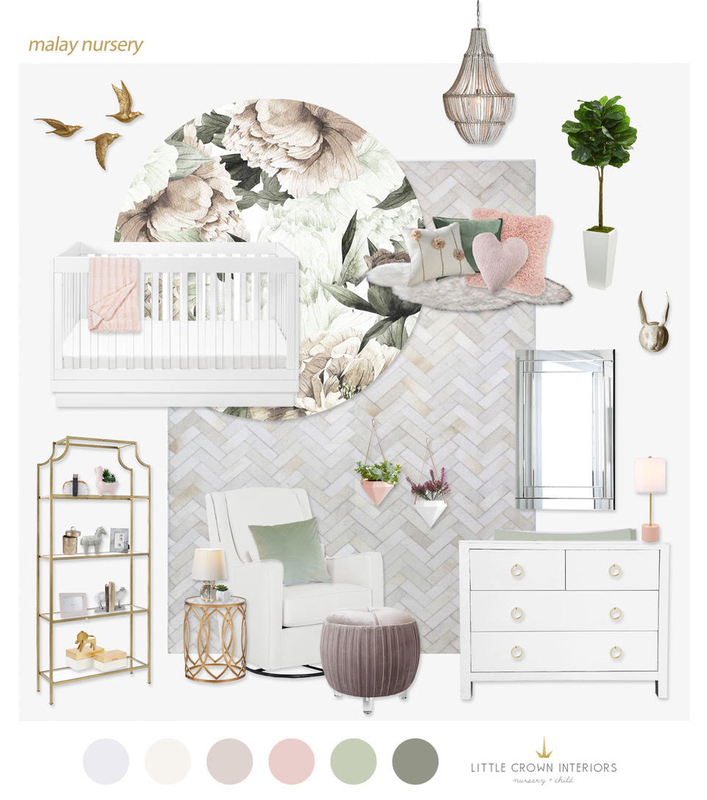 I especially love the look of an acrylic crib with a statement wallpaper because it brings out the wallpaper and provides an open airy feeling to the room! Another thing I’m loving are all the cozy pillows, plush rugs and decor pieces that bring pops of color and texture into the space. This is something that really adds depth into the room and ties everything in together. We sourced a few of these pieces from Naomi’s Little Crown Interiors Shop which has her hand-picked finds for decor, gliders, crib bedding and wall monograms! What do you guys think?! Stay tuned for the nursery reveal coming SOON! Ale is a lucky little girl!! Loving all this decor..so pretty! These are all such cute pieces! The nursery looks amazing.Your baby is one lucky girl and she deserves it. By the theme of these photos, I know her nursery is going to look amazing. Can’t wait for the official reveal! I love interior design. This nursery is coming along so beautifully! Congrats girl! Thanks girl!! So glad you love the inspo :) Stay tuned for the final reveal!! I love this color palette combination. So soothing and relaxing. Beautiful decor, so perfect for your baby girl!